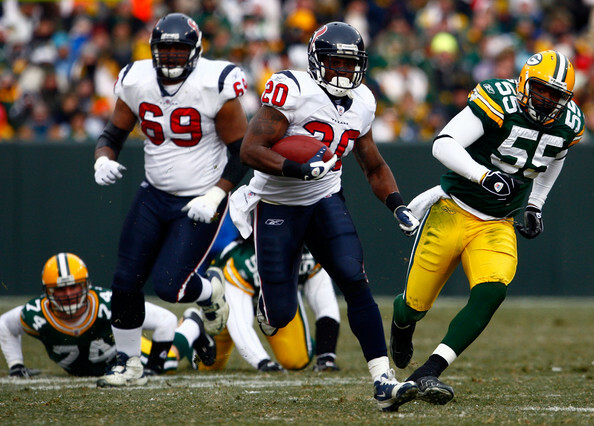 If Houston Texans Move Steve Slaton what will they get in return? At the beginning of this month, a NFL rumor created the rounds that the Houston Texans were planning to showcase Steve Slaton this NFL preseason in an effort to drum up some trade interest. With Ben Tate returning to a running back stable that already options 2010 rushing champ Arian Foster, the concept is that the team may get either a lot of helpful players from the 2012 draft choose in exchange. Speculatively, Slaton had been connected to the Cleveland Browns, Miami Dolphins and St. Louis Rams, from those teams may use a third-down back like Slaton as a complementary player. Slaton is not safe to move, but would not be surprising to see his name still mentioned in regard to back-up market. Len Pasquarelli of the Sports Xchange had an Idea in one of his recent columns, noting that "the Rams could use a reliable back capable of getting 6-8 touches per game, to reduce the workload for Steven Jackson." However, he does say "the talk has been unsubstantiated" thus far.